Orange juice is the sweet, somewhat tart liquid extract derived from the orange (Citrus × sinensis) fruit. This citrus fruit is widely known for its plethora of beneficial nutrients, and orange juice is no different. The most popular fruit beverage in North America has become a staple at many a breakfast table for its taste and its health benefits, of which it has many. Moreover, orange juice is low in cholesterol, fat, and calories. Similar to other fruit juices, however, orange juice contains a high amount of natural sugar. This makes orange juice potentially unsafe for individuals with diabetes or other blood sugar issues. For everyone else, orange juice is a healthy beverage that can be consumed daily. Pairing up orange juice with high-calorie and high-fat meals can reduce the occurrence of atherosclerosis, a condition wherein the blood vessel walls harden. Orange juice can minimize the chances of experiencing heart attacks thanks to its content of hesperidin and magnesium. Hesperidin is a plant-based substance that contributes to improving cell health which in turn prevents the arteries from clogging up. Magnesium helps by lowering blood pressure. Neural tube defects are a result of folate deficiency, a condition that can be prevented by taking in high-folate meals and beverages like orange juice. A half cup of orange juice can provide 40 micrograms or 10 percent of the recommended daily intake for expecting mothers. Orange juice is one of the best sources of vitamin C, an antioxidant vitamin that is most known for its immune system-boosting quality. This powerful antioxidant neutralizes free radicals before they can damage our body’s systems. Furthermore, the flavonoids in orange juice promote quicker healing processes. The vitamin A content in orange juice is such that it can improve kidney function and assist it in the detoxification of the body. To get fresh orange juice, roll an orange on a flat surface to make it easier to peel. Remove the peel, cut the fruit in half, then remove the exposed seeds. Afterwards, juice or squeeze each side. If desired, remove the pulp by running the extracted juice through a strainer. Orange juice concentrate is also available, and is as nutrition-packed as fresh orange juice. 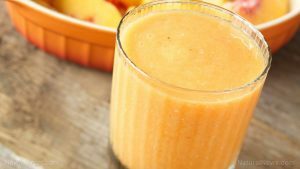 Besides drinking orange juice as is, it can be included in other recipes, such as orange juice chicken, orange juice cake, and orange-nut muffins. Freshly squeezed orange juice is loaded with a variety of nutrients that are essential to the body. Frequently drinking orange juice can reduce the risk of atherosclerosis, heart attack, and neural tube defects, while simultaneously protecting the immune system and kidneys. However, orange juice has a high amount of natural sugar and should therefore be avoided by diabetics or individuals with blood sugar disorders.